Rustic River Cabin is ready! Our rustic river cabin is ready and open starting in October! 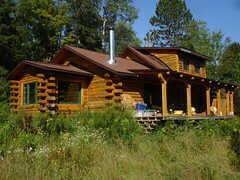 Situated across the road from the main house and on riverfront property, this the largest of our 3 cabins. It features 2 bedrooms, a large living and kitchen area, and a breakfast nook. There is still some landscaping to be done outside, but that will have to wait for spring--Wisconsin winter is upon us!